Folkmanis 2935 - Found in swamps and lakes all over North America, bullfrogs are also known for their appearances in folktales and storybooks. 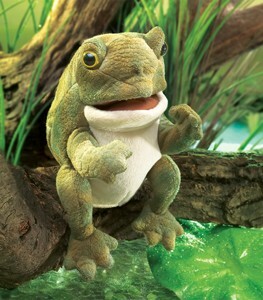 With a soft green textured body and a generous belly, this easy to animate BULLFROG PUPPET can be a talkative storyteller, a naturalist or a good friend to cuddle with. Measures 7" x 6" x 8". Hand puppet with moveable mouth.